Scientific journal "Measuring Equipment and Metrology" founded in 1965. The journal reported in the scientific-metric database Index Copernicus. The publications of the scientific journal are provided with digital object identifiers (DOI) by CrossRef. Certificate of registration of print media: KB series number 13126-2010R. The main program objectives magazine: the objective of our journal is the implementation of the efficient IT technologies enriched by the “measurement component", in everyday life independently of areas (science, industry, health-care, etc.). Therefore, basing on reliable data of measuring instruments, the published articles focus on both scientific novelty and practical value. It is the metrology itself which determines algorithm of operating the microcontrollers assuring the exact and precise work of the complex control systems as the low-leveled constituents of CPS. Transforming and Processing the Measurement Signals. Means for Measuring the Electric and Magnetic Quantities. Means for Measuring the Thermal Quantities. Metrology, Quality, Standardization and Certification. 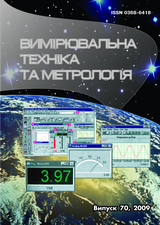 The journal "Measuring Technology and Metrology" founded in National Polytechnic University, Lviv, Ukraine, 1965, is characterized by a rich history. Since 1991, with the acquisition of independence by Ukraine, it is published in Ukrainian. Strengthening international cooperation caused the publication of articles in English. At the same time, the development of nanotechnology and works under the auspices of European programs has led to the spread of interdisciplinary researches, which corresponded with the journal's profile - the interdepartmental proceedings. This is evidenced by the publication of a thorough monograph "Handbook of Thermometry and Nanothermometry" (the author is the permanent Main Editor, from 1982, and, the Honorary Editor from 2018 of the journal - Head of the Department of Information and Measuring Technologies, prof. B. Stadnyk. There are the works in the issues, where the authors are academics from different countries. This process is strengthened by the 4th Industrial Revolution in Europe - Industry 4.0. Scientists of the Department of Information and Measuring Technologies of Lviv Polytechnic National University, that form the core of the Editorial Board of the journal, intellectualize their own research. Following the steps of Metrology 4.0, in 2016, we have released a monograph “Cyber-Physical Systems. Metrological Issues”, 2016 (edited by prof. B. Stadnyk and prof. S. Yatsyshyn). In the near future, the realization of the potential of Cyber-Physical Systems, based on constantly updated data of measuring means, may face the need for specialists with an extremely wide range of knowledge: from cybernetics and systems theory to computer science and metrology programming. And this is a subject covered by sections of journal. For its better study at the Department of Information and Measuring Technologies, the chain of new laboratories is developed: a) from the National Instruments Co., USA, on the basis of LabVIEW that simplifies hardware integration so that you can rapidly acquire and visualize data sets from virtually any I/O device; it was designed to substantially simplify the formation and implementation of unique virtual and ad hoc tools, including measurements, by rapidly visualizing data samples; b) from the Cypress Semiconductor Corp., USA, for the study, design and implementation of microcontrollers for various fields of science and technology; c) from the IFM Electronic, Germany, on research, programming and using the smart sensors; d) from the SIOS, Germany - for implementing the laser interferometers for studying nanoscopic processes of deformation in bodies, their vibrations, etc. Publications of scientific papers in these directions become the major "vectors" of development of the "Measuring Technology and Metrology" during the last few years. After all, they are those directions of scientific researches, the results of which are recently applied in contemporary technology. For instance, the continued research and development of Quantum Standards in the world have discovered the gap which consists in the absence of Quantum Standard of Temperature which turns out to be the only one non-quantum quantity of the major SI units. So, we have fulfilled the great work and proposed this unique device as the supporting pillar of emerging Quantum Thermometry, basics of which were published in "Measurement Technology and Metrology" issue, No. 77, 2017, pp.40-49. Our scientists and lecturers, who successfully change their scientific interests according with technological progress, have the opportunity to participate not only in the transfer of technology to industry, but also in the further development of technologies. They permanently rise up the level of the journal basing on the obtained results of scientific research. You can testify to this in the membership of the Editorial Board of the journal, where, apart from the professors of the Lviv Polytechnic and a number of educational institutions of Ukraine, Germany, Poland, the outstanding leaders of the leading IT companies of the world are represented. Pay attention to the following feature. Individual works are grouped in volumes in such a way as to achieve the main goal of each bulletin, which is to publish the high-quality scientific issues as quickly as possible. The sections of our journal, related to the initial structural levels of Cyber-Physical Systems, describe the various stages of obtaining and further processing of the primary information necessary for their effective work. It is precisely metrology that determines the algorithms of microcontroller operation, which ensures the accuracy and reliability of the work of complex control systems in different areas of human activity. Draw your attention please at the next peculiarity. Separate papers are grouped in volumes in such a manner which accomplish the main goal of each bulletin that consists in as fast as possible publication of high quality scientific knowledge. Sections of our magazine related to low structural levels of Cyber-Physical Systems describe various stages of obtaining and further processing the primary information necessary for their operation.